Steam trains may be old, but I doubt even William Shakespeare was around long enough to get a ride on one. What do you think the playwright would make of them if he ever got a chance to see this nineteenth century marvel? I bet they would have featured in a few of his productions - maybe as a form of witchcraft. You too can be bewitched by the magic of locomotion, while celebrating the 450th anniversary of one of our greatest writers. Up until the 7th September, Vintage Trains is running the Shakespeare Express; travel from Birmingham to Stratford-upon-Avon on a railway journey steeped in culture, history, and natural beauty. You will be taken on a fifty-mile journey through picturesque countryside at a speed of up to seventy-five miles per hour, depending on the train. 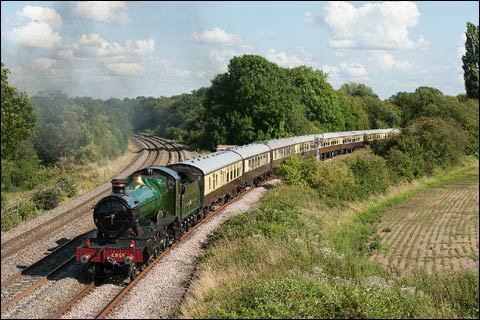 The Shakespeare Express runs two types of train; first is the 4965 Rood Ashton Hall, originally built in 1929 by Great Western Railway for mixed traffic duties.and hauling freight or express passenger trains. Second is the 5043 Earl of Mount Edgcumbe. Built in 1936, it has a double chimney and four-row superheater. It was once considered the fasted train in the world, reaching speeds of up to 98 miles per hour. The standard price for a return trip is £20/£25 (advance/on the day) for adults and £12.50/£15 for children. There are also other standard rates, but if you want to treat yourself, you can also book a premiere dinning experience. Depending on the time of your journey, you can choose between breakfast, lunch, high tea, or afternoon tea in a first class carriage.